There is a small pizza shop in New Haven, Connecticut called Pepe's Pizza. To my husband, L., who grew up in New Haven, Pepe's is the supreme standard of pizza to which all other pizzas we've sampled around the world are compared. Until one year ago no other pizza came close until that fateful day in 2011. For my husband's birthday every year I surprise him with an adventure. One year it was a flying lesson, this year it was indoor skydiving. Last year it was a private cooking class with one of Seattle's best chefs-- Joel Gamoran who at the time shared his secrets at Sur la Table in Kirkland, WA. Cooking is NOT one of my husband's hobbies so when we walked into Sur La Table supposedly to pick up a new Le Creuset pan, he was not bowled over when we walked in and I said "SURPRISE! Happy birthday! "He was however, shocked that I chose a cooking class for his adventure. L. was a good sport when we were escorted to the kitchen to meet our chef, Joel, who would teach us in a private session how to make the perfect pizza. This is when L. smiled. You see, for as long as we dated and then married I had tried to make pizza. We bought pizza stones (which I somehow managed to break and melt) and I had even taken a pizzamaking class. I failed and I failed. There were times when the pizza I put on the table was raw in some spots and burnt in others. Yet, L. seeing his favorite meal on the table didn't let that fact that dinner was a disaster disturb him, he ate around the raw and the burnt and he was happy. When I was thinking about his birthday last year I thought "What does he love?" "Me and pizza." And so it was on that afternoon that L. and I tied aprons wrapped around our waists in a kitchen with a chef where we learned to make the best pizza we’ve ever had. Here is how to make pizza at home that will rival the best pizza place in your town AND it’s easy. It’s OK if the first batch isn’t perfect but it will be and once you see how easy it is you will never order in again. Divide dough into 6 equal portions; roll each into ball. Use immediately. 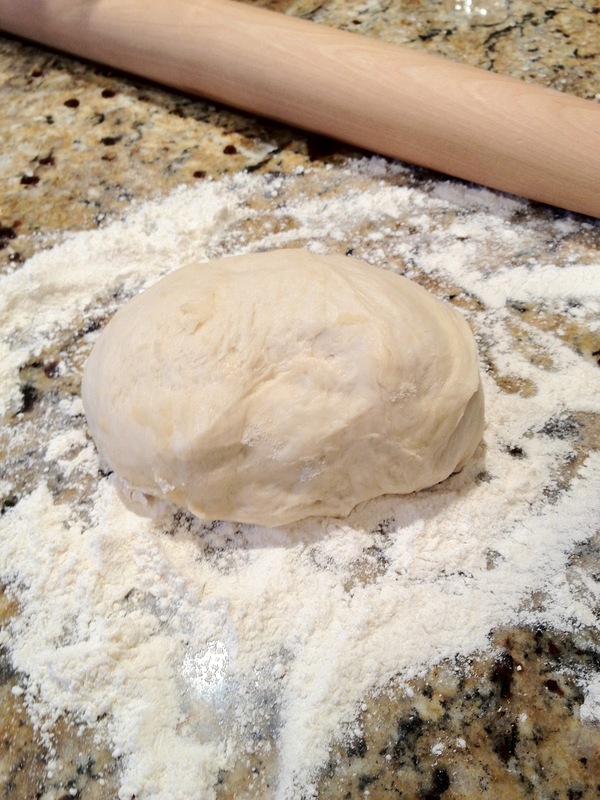 *It may seem complicated but once you make the dough you can use one ball of dough immediately and freeze the others. To freeze, add a small amount of olive oil to a quart size freezer bag, add dough then roll out extra air and seal. When you are ready for a pizza, defrost the dough by leaving it out in the morning before work or at least a couple hours. Heat pan to medium heat. Add olive oil and garlic. Saute for one minute. Toss in the basil on top of the garlic and let the basil wilt. Add tomatoes and vinegar. Let simmer for 5 minutes. Blend mixture with immersion blender then simmer for an extra 15 minutes. *Many pizza sauces are sweet. This sauce is perfect. *You will have extra sauce. It freezes well. Roll out your dough on a floured surface aiming for about 10 inches across. Mix your cheeses together in a bowl. Move raw pizza disc to a pizza pan. Add a thin layer of pizza sauce going out to about one inch from the edges. Top with your cheese and then pepperoni. Spread a thin layer of cornmeal on the pizza paddle and add your dough on top. (The cornmeal acts like mini ball bearings under the dough allowing you to shift the raw pizza to the stone. DO NOT try this without cornmeal. Your pizza will never shift from the paddle to the stone.) Test to see that the dough can roll easy on the paddle. Toss the cheese together in a bowl. 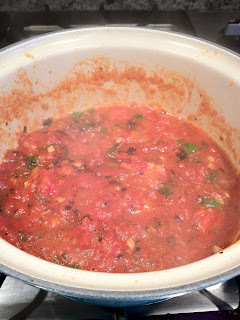 Add a thin layer of sauce going out to about one inch from the edges. Top with your cheese and then pepperoni. Using your paddle you should be able to use a quick flick of your wrist to get the pizza from your paddle to the stone. *The key to perfect restaurant quality pizza is the dough, a pizza paddle, a pizza stone and a very hot oven. About one hour prior to preparing your pizza, heat your oven to 450 degrees and put your pizza stone on the top shelf to heat. *I have literally burned through 6 pizza stones. The best one that works for us is the Emile Henry Cooking Stone. Good luck and if you get a chance, take a cooking class, especially one at the Sur La Table location in Hell's Kitchen with Chef Joel Gamoran.